Notorious British singer, piano player and guitarist, Mike Sanchez, will be headlining at the Jam House, Birmingham on Thursday 12th October 2017. Mike Sanchez is a local musician, raised in Kidderminster, and has a huge following of fans from all over the world, including many famous rock and blues legends who have lined up to work with him. Notoriety first came to Mike with the Big Town Playboys, the band he formed in the ‘eighties with Andy Silvester and Andy Fairweather-Low, touring with the likes of Eric Clapton. He then became a full-time member of Bill Wyman’s Rhythm Kings, fronting the band alongside Georgie Fame, Beverly Skeete, Albert Lee, Andy Fairweather-Low and Eddie Floyd on their annual world tours. Mike is known as one of the most exciting and charismatic performers of Rhythm & Blues and Rock ‘n’ Roll in the world today and his band performances continuously receive fabulous reviews throughout the blues and rock scenes across the UK and Europe. 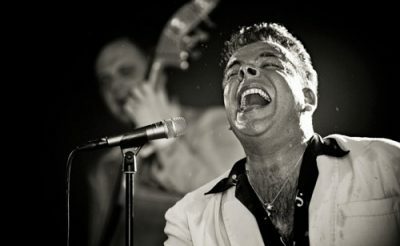 His performance at the Jam House is set to bring the house down, pumping powerful boogie-woogie anthems all night long.